It is a miniature audio amplifier, which is designed specifically for improving human communication. 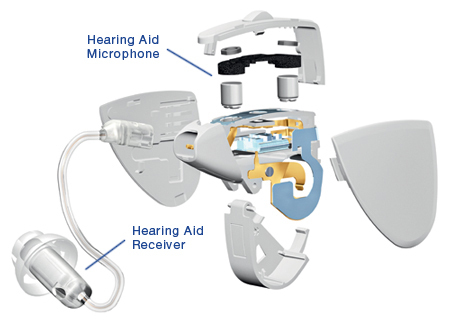 A hearing aid is a small electronic device that you wear in or behind your ear. Its makes sounds louder so that the person with a loss of hearing can hear effectively and communicate well during his or her daily activities. A hearing aid can help people hear both in quite and in noisy situations. The microphone’s function is to convert sound into an electrical signal. Microphones are used in many applications such as telephones, hearing aids, public address systems for concert halls and public events. Hearing aids process sound so people with hearing loss can more easily understand it. Sound may be amplified for example, or separated into different parts, like background noise and speech. It all begins with the hearing aid microphone. The microphone’s function is to convert the sound waves we hear into electricity, so they can be digitized, and then enhanced for the needs of people with hearing loss. An amplifier is an electronic device that increases the voltage, current, or power of a signal. If you wear a hearing aid, you’ll know it uses a microphone to pick up sounds from the world around you and convert them into a fluctuating electric current (a signal) that constantly changes in strength. The hearing aid must change enhanced signals back into sound waves so the brain can properly perceive them. Enter the hearing aid receiver. Its job is to convert electrical signals into acoustical output signals, or sound waves, and direct them into the wearer’s ear canal for the brain to hear. Receivers look similar to microphones. Some hearing aid designs place the receiver right in the ear canal. Some styles use a tiny tube to connect the receiver to an ear mold worn in the ear canal. As its name implies, the volume control adjusts the loudness setting in a hearing aid. Most modern models adjust the volume automatically as the wearer moves from one listening environment to another. Some hearing aid users prefer to have a manual volume control such as a dial or a switch in order to manage volume themselves. The battery supplies the power to turn the electronic components on and off. The batteries most commonly used for hearing aids use zinc and oxygen components, and are known as “zinc-air” batteries. The sticky tabs on zinc-air batteries prevent air from coming into contact with the zinc electrodes. The battery will not operate until the tab is removed.